Create ER diagram on Mac in a simple way that is much easier than before. Use predefined ER diagram shapes or templates to get started rapidly. Entity relationship diagram (ERD) is a kind of diagram for presenting visually the structure of relational database. 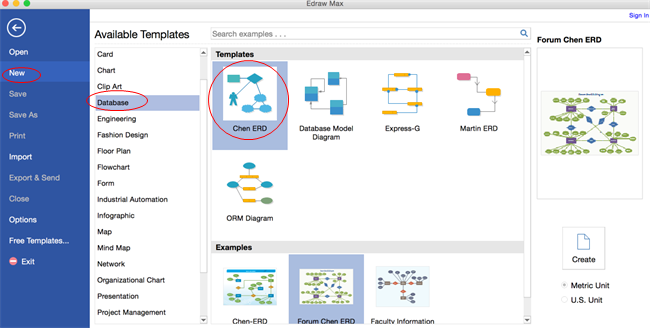 In this tutorial, we will show you an easy and effective way to create ER diagram with Mac ER Diagram Software. On the File menu, point to New.-> Click Database, and then double click the icon of Chen ERD or Martin ERD. Drag and drop shapes from ERD libraries to the canvas. Drag the green square handles to resize shapes. Right-click shapes to set the attributes of each object. Every ERD shape has some underlying data, or attributes. These attributes specify the appearance of the shape, as well as additional data associated with the shape. Right-click the shape and click Define Shape Data to view and change the main attributes in the shortcut menu. There are 2 ways to connect ERD shapes. The built-in ER Diagram shapes are designed with connection points that allow auto connection. Drag connectors from Relationship library to connect shapes. Drag the beginning point of the connector to the first shape and drag the arrow of the connector to a connection point of the second shape. The connector endpoints turn red when the shapes are connected. You can also use the Connector tool under Home tab to connect shapes manually. You can change the connector type by right-clicking the connector and then clicking the type you want in the shortcut menu. As for a text box of a connector, drag the yellow control point to move it quickly. 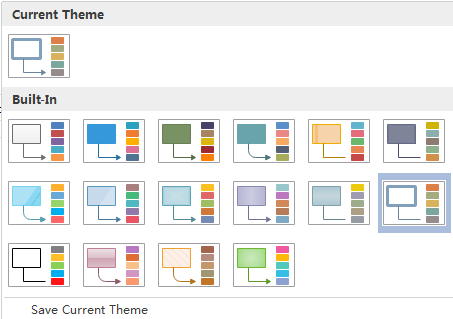 By changing ER Diagram theme, you can enhance fill, line and text style altogether at 1 click. Go to Page Layout tab, select another theme. 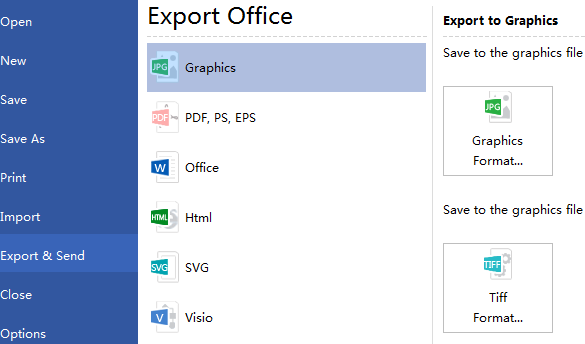 Hit Export & Send under File to export the ERD as images, presentation slides and web documents and so on. To preview your document, click File tab and then choose Print. TIP: To magnify the image of the document, use the zoom slider below the preview. 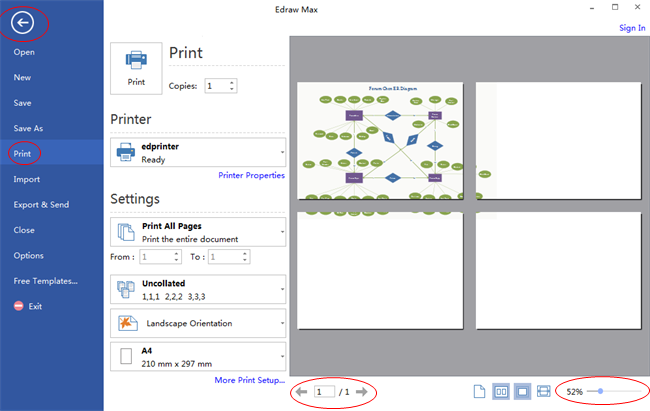 To go back to your document and modify it before printing, click the top left arrow. Here are some ERD examples. They can help you get inspired and get started quickly.